MICROSCOPY UK / MICSCAPE - Topical Tips 5. Amateur Microscopy. Editor's note: I'm sure we've all acquired tips, techniques, 'tricks of the trade' or perhaps made simple gadgets while pursuing the fascinating hobby of amateur microscopy. Why not share some of yours with our readers, who may not have come across them. Just send us a short note in an e-mail (contact in footer), enclosing a scanned picture or drawing if you wish and we would be pleased to compile, upload and acknowledge your contributions. Many new and used microscopes are not supplied with a case. I have found that some 16mm or 8mm silent projector cases make a heavy-duty microscope case. I use a Bell & Howell 8mm case that opens on the side to remove the projector. I find this works fine for my Olympus mono/bino microscope. I have to remove the head, however, so the basic scope can fit. The bino' head I store in a soft zippered pouch, and both heads are stored inside the case. Search around flea markets, antique stores, etc., and see if you can find a projector case that will house your valuable microscope and some accessories. Some microscope cases have sections for storing oculars, while others don't. I found that a wrist watch case is handy for storing two sets of oculars (10X and 16X pairs). Such a case is usually heavy-duty cardboard, plastic or fabric. Some pieces of bubble wrap on the bottom and top of a hinged watch case keep the oculars from rolling around once the lid is closed. 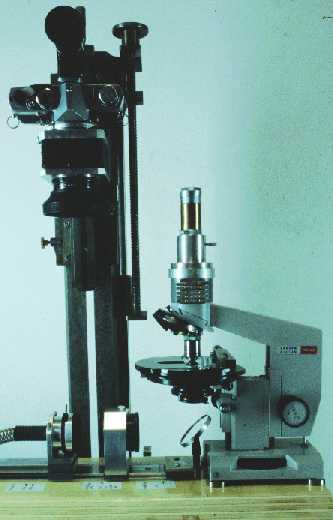 Stereo microscopes without built-in illumination in the base can still be used to view subjects with transmitted light. Since the power of stereo microscopes is in the 20X range, very strong illumination is generally unnecessary. Obtain a thick piece of styrofoam at least the size of the base of the microscope and about 4 to 6 inches thick. Cut a horseshoe shape out of the end of the styrofoam piece so the the opening in the base of the instrument fits over the horseshoe opening. Place a piece of ground glass between the opening of the scope and the styrofoam. Insert a flashlight that can be operated at a right angle beneath the ground glass. In this manner, one can observe transparent objects, such as prepared slides, pond life in Petri dishes, crystals, plant specimens and similar subjects. One can also experiment with different light sources, mirrors, etc. And, of course, the viewing is impressive in stereo. Contributions above by Chuck Huck, comments welcomed. Editor's note: Ted Clarke has an interest in achieving the maximum potential from optical systems like the Russian Biolam range (which the Editor also possesses). His recent observations on the use of the Russian aplanatic condenser NA 1.4 may be of interest to other users, and Ted has kindly agreed for them to be published here. I have done some more testing and some thinking about why the image quality was so poor when the condenser was oiled and the aperture was set to fill about 80% of the rear element of the 90X objective. I believe that the poor image quality is the result of oiling the condenser. The image quality is good when the condenser is dry. Köhler illumination can then be achieved with the 90X objective, but only with a dry condenser. The best illumination is with a 245 mm distance from the collector lens to the condenser with about 0.70 mm air gap under the slide to the top of the condenser. If you think about what happens, if there is a significant gap you will see how the spherical aberration of the illumination system would be drastically increased when this gap is filled with oil. The condenser is claimed to be aplanatic. I maintain that it is aplanatic at high NA, but only when used dry. The LOMO information indicates that the condenser is expected to normally be used dry. The claimed 1.40 NA can only be achieved when the air gap below the slide is filled with oil, but then the image quality is ruined by the spherical aberration in the illumination caused by oiling the condenser. I believe that this illumination with an oiled condenser will be very useful for darkfield using the water immersion 30X objective without a cover glass. The necessary major increase in tube length for use without a cover glass will increase the magnification of this objective to almost 40X and the maximum NA will increase from 0.90 to about 1.00. The 60X 1.00 NA apochromat could also be used with the darkfield but always with a cover glass. In summary I think that brightfield requires good Köhler illumination, which requires minimal spherical aberration in the illumination. A brightfield condenser for high NA should not normally be used with oil unless it is designed to always be used with oil. I do not believe the essentially zero gap thickness needed for a design allowing either dry or oiled use is workable unless the slide thickness is very well controlled to the nominal 1 mm. This was not done for the LOMO condenser design but may be done by Zeiss and Leitz. Commments on the above to Comments to the author sent via our contacts page quoting page url plus : ('tclarke','')">Ted Clarke are welcomed. The Russian aplanatic NA 1.4 condenser (which also has oblique illumination). The top lens has been fitted with a brass collar made by Ted Clarke to help retain the oil when immersed, as the gap is too large to allow a stable oil film between condenser and slide. Ted Clarke's modified Biolam Multiscope®; a US model with epi fluorescence, reflected brightfield, and transmitted phase contrast upgrades. The microscope has a home-made housing attachment with rotary dovetail ends containing the analyzer and wave plates for polarisation studies, and the eyepiece is in a drawtube. The lighting uses a fiber optic light guide and the field lens is an old SLR lens. The condenser with this illumination system is capable of darkfield with the 90 X 1.25 NA oil immersion objective. 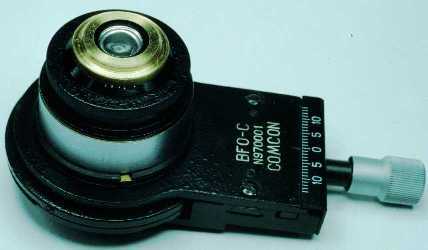 The spider mounted darkfield stops go in a slot at the end of the light guide where the aperture diaphragm is also located. For further details, see: Clarke, T. M. "Building an Affordable Universal Student Microscope"; THE MICROSCOPE 2000, 48, 19-39. Published in March 2001 Micscape Magazine.